Al Rayyan Doha (D1) strengthened their roster with addition of 31-year old American power forward Lenny Daniel (203-100kg-87, college: CS Northridge). 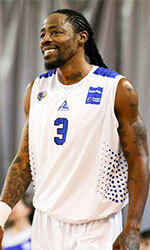 He started the season at Union Neuchatel Basket in Swiss SBL league. In 9 games he recorded 10.4ppg, 5.7rpg and 1.1bpg this season. The last summer Daniel played at Punto Rojo (National League) in league where in 13 games he averaged impressive 16.7ppg, 10.2rpg (#4 in the league) and 1.8apg. He was also named League Player of the Week. In 2012 (a year after he left the college) Daniel was drafted by Fort Wayne Mad Ants (D-League) in third round (42nd overall). The former Cal State - Northridge standoutis in his eighth season in pro basketball. His team won Bulgarian Cup in 2015. Daniel is quite experienced player. Thanks to his pro career he managed to play on four different continents (Europe, Asia, Latin America and of course North America) in eight different countries. Daniel has played previously professionally in Argentina (Asociacion Mitre Tucuman and Hispano Americano de Rio Gallegos), Greece (Apollon Patras), Israel (Maccabi Kiryat Gat), Korea, Taiwan, Bulgaria (Cherno More), Vietnam (Saigon Heat) and Thailand (Thai General Equipment).